Site News / New art for the main site? Lately a few people have expressed interest in creating new art for the main site. As the current banner is nearly 9 years old (over half the age of the site itself!) it's a good time for a visual refresh. We're going to need a new banner, as well as a logo (currently we're just using the banner image as the logo as well in multiple places). So if you're interested please let me know here in this topic or message me privately! The details of technical specifications as well as any other requirements will be sorted out soon; we're just trying to gauge interest and give everyone a heads up for now. There's no guarantee we will be using anyone's particular artwork, but we will be open to submissions. Introducing a new role: Ghost Updaters! Periodically we'll review our staff and make role changes as appropriate to reflect our current status. Please join me in thanking our wonderful updating staff for their past and continued service! Request / [N64] The Legend of Zelda: Ocarina of Time - "Spirit Temple"
This is a technical guide to cross-staffing notes in full Finale. It will go over how to make the program cross-staff notes, but not advise on when you should do so or provide good notational practices when doing so (we can write those up somewhere else if needed). I'm using Finale 2014, but the same tools should be available in other versions (not Notepad), though the buttons may look a bit different or be located in different places. First, write out the notes you want on a single staff. Then, find the Note Mover tool and select the Cross Staff option. Then, click on the staff that has the notes and drag the boxes for the noteheads you want to move to the staff you want to move them to. 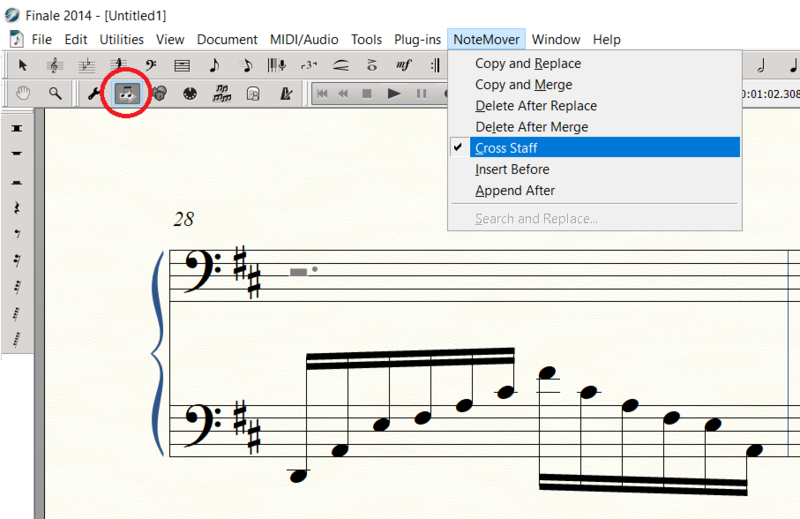 You can click and drag to select multiple noteheads instead of moving each individually. Depending on what you're writing, that may be all you need to do if you want to leave the beams untouched. Lastly, you may need to adjust the beam angle of the tool using nothing other than the Beam Angle tool! Use the left box for each beam to adjust the starting position of the beam and the right box to adjust the right endpoint relative to the left. There are a lot of different ways you may want to cross-staff notes that don't match the simple example I provided above. But toying around with the few tools I mentioned above should get Finale to do pretty much whatever you need it to. This is a (non-exhaustive) guide to writing out basic rhythms in 4/4. Of course there are always exceptions and complications, but here's what you need to get started! 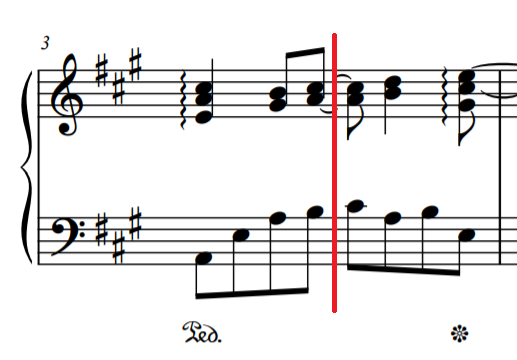 Notating rhythms is more than just having all your note durations correct. When grouped improperly, they can be difficult to read. 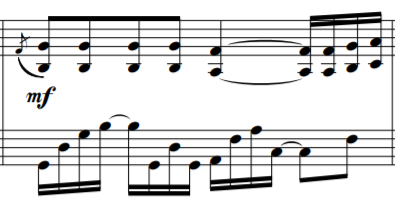 The sheet should expose the underlying beat so that the performer can follow along with the beat. 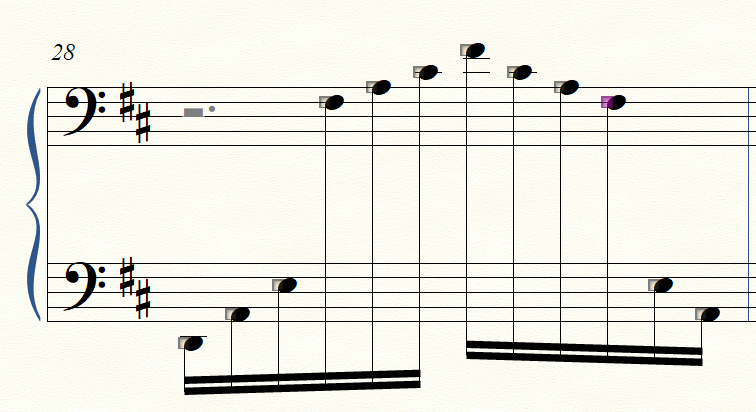 To do this, you can break up notes that pass through important beats by breaking them up into tied notes. Unless the rhythm is very simple, expose beat 3. If you have sixteenth notes, expose the other beats. Note how it's easy to see all four beats in the left hand because they are grouped separately. And in the right hand, the quarter note is tied to a sixteenth note that falls on beat 4. I haven't mentioned rests at all yet, but the same basic principles apply when you have them - show the beat when needed. That's pretty much it! If anything's unclear, feel free to ask! Site News / Introducing Help Guides! Something new for today! Introducing Help Guides! We often have members both new and old asking questions and looking for help - often seeking the same answers that aren't well documented anywhere around here. It's easy for longtime members to forget where they've seen a helpful explanatory post before, or for new members to not know where to find the answer to a question that has been answered in the past. The plan is to add a section of resources to NSM to give users something to refer to. Help with rhythm grouping? 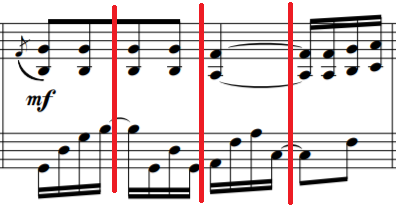 How to find the key signature of a piece? Need to cross-staff notes in Finale? These guides will be written by our members, for our members, to fit our unique needs as a video game sheet music community. Think a guide for a specific topic you're thinking of would be helpful for everyone, but don't know enough to write it yourself? Request it here! A Help Guide is a guide written by one of our forum members that... helps. One could view this new system as an evolution of the outdated NSM Resources. These guides will be written by our members, for our members, to fit our unique needs as a video game sheet music community. Here's how the process will work! Write up your guide and post it as a topic here. The original post will serve as the guide. (If you have something written up somewhere else on the forums, you can repost it in a new topic here or ask us to move it.) Members will comment on the topic, giving feedback to improve the guide, and we'll work together to edit it to be correct, clear, and concise. After your guide is approved by two updaters, we'll move it up to the main Help Guides board with the other accepted guides. The topics will always be open to comments, with the guide in the original post editable by the writer and staff. This way, people can still provide feedback if something was missed, or ask questions if they're confused (so they can get an answer and also help improve the clarity of the guide if it isn't easily understood!). If needed, later on we will create different sub-boards as categories for our guides (music theory, Finale help, arranging tips and tricks, etc). Any questions, ask away here! After a bit of discussion with the staff, trying something new! With the release of Super Smash Bros. Ultimate just around the corner, we're planning an update for December 7th consisting of sheets from any official Super Smash Bros. game. If you would like to contribute your arrangements, you can post them here. However, please note that this is not an arrangement project similar to the ones we've done in the past. Due to time constraints, sheets must be arranged and reviewed by December 7th in order to be included in the update, and we cannot guarantee that everything posted here will be uploaded to the site with the update. As always, help reviewing is much appreciated. You can find files HERE for what is currently included. - Moving the piano arrangements board (personal arrangement threads) into the NinSheetMusic category - the category deals with things on our main site, and this board contains arrangements that will (ideally) eventually be submitted to the main site. - Creating a Project Archive board to keep the past projects separate from submission topics. - Making a performance category to house the three related boards. - Moving the gaming category to the Other (formerly Off-Topic) category - the Sony/Microsoft/PC boards were hardly being used and taking up space as "main" boards. The Nintendo board along with those three are sub-boards of the General gaming board. Octopath Traveler is now available, and so are eight new sheets! Here are piano arrangements for all the main character themes!